1 - cap/s $3.95 ea. 3 - cap/s $2.95 ea. Enjoy these Super Soft 100% Cotton Baby Caps - perfect gift for a baby boy or girl with white, blue, and pink stripes. 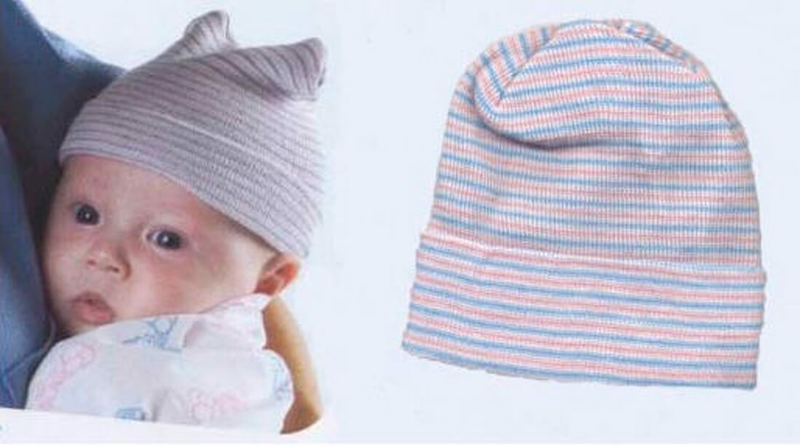 These Baby Caps are designed to gently stretch to fit the head of babies and stay nice wash after wash. Made in the USA. Machine wash & dry. Need a Larger size? For older than 3 months - use our Cotton Comfort Sleeping Caps available in 7 solid colors. Please note - Baby Caps are not intended to be used as sleepwear because they are all cotton and not sprayed with any anti-flammable chemicals. They do not meet the minimum standards of the Flammable Fabrics Act pertaining to children's sleepwear.